Only about a 35 minutes drive from Whitewater, WI, Beluah Bog is a great place to hike. This is much more unusual then any of the previous posts have been. For those of you that don’t know a bog is a wet muddy ground too soft to support a heavy body. Which is why they have bridges throughout the park. 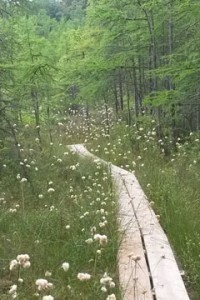 This place offers many unusual plants that are more typical in the northern bogs. One of the main features includes, a shallow bog lake that is covered in white and yellow water lilies. This is one of the only undisturbed bogs in the area and this is a rare site. Wildlife in the area include bullfrogs, and dragonflies. Definitely worth the trip!